These volleyball rules review the regulations for basic skills, for volleyball scoring and for playing actions allowed and not allowed in the game. The Volleyball court is shaped like a 30 ft by 60 ft rectangle. In meters its 18 meters by 9 meters. The playing area for a court is in the shape of a large rectangle that measures 30 feet by 60 feet. 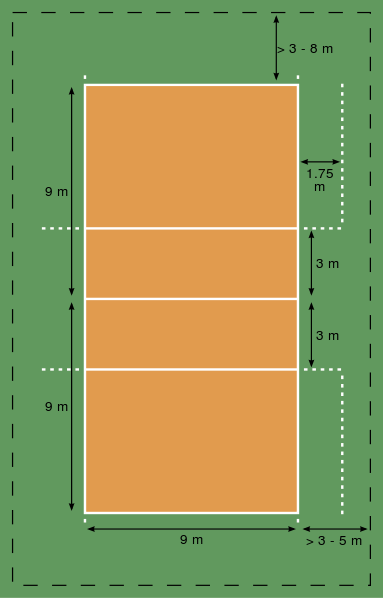 The boundaries of the court are referred to as lines. 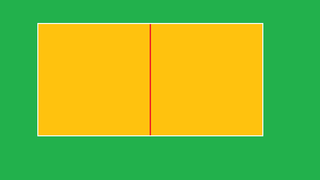 The longest lines are the sidelines and the shortest lines of the rectangle are the endlines. 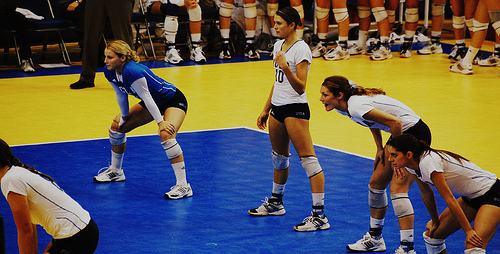 The volleyball court sidelines are the longest lines on the court. Diagram by chibaryo. The volleyball court endlines are the shortest lines on the court they connect the two sidelines. Diagram by chibaryo. The centerline runs across the middle of the court and connects the two sidelines. It divides the large rectangle into two equal sized half courts measuring 30 feet by 30 feet. The centerline is under the net and runs parallel to the the endlines while connecting the sidelines in the middle of the court. Diagram by chibaryo. On each court half, there's a ten foot line which divides the half court into thirds. The ten foot line also known as the attack line divides the court into thirds on both sides. Diagram by chibaryo. The front third of the court is called the front zone. It runs from the centerline to the ten foot line and is the line that front row players stay in front of when they are performing their blocking defensive skills in volleyball when their team is on defense. The front court zone is located between the ten foot line and the centerline and both sidelines on both halves of a volleyball court. Diagram by chibaryo. The two-thirds of the court which run from the ten foot line to the endline is called the backcourt and is where the backrow players stay when playing in defense. The backcourt zone is located between the ten foot line and the endlines and both sidelines on both halves of a volleyball court. Diagram by chibaryo. If during a rally, you attack hit a ball that goes into the opposing team's court and the ball hits any part of the boundary line (sideline, endline)...that ball is considered "In" the court. Point for your team. Serve for your team. On each half the court there are six invisible zones with corresponding numbers which help dictate which way each of the six players need to rotate after they've earned the right to serve. Left front area is Zone 4. Middle front area is Zone 3. Right front area is Zone 2. Left back area is Zone 5. After a team wins the right to serve, the volleyball rotation rules state they have to rotate clockwise so the same player does not serve twice. 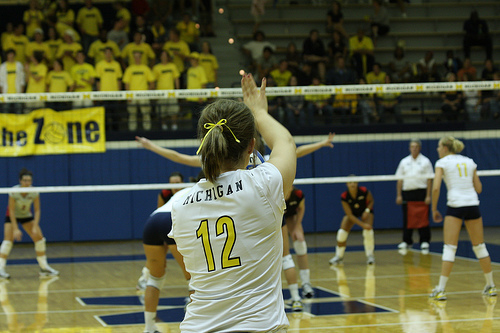 Players cannot touch any part of the endline while serving the ball. They can step over the endline once they've contacted the ball in their attempt to send it over the net into the opposing team's court. Players on a team must stay within their half court during reception of serve. Players can go off the court to retrieve a ball back into their court as long as they stay within the designated playing area. The net is placed on top of the centerline and runs parallel to the endlines and perpendicular to the sidelines. According to official volleyball game rules, the net's purpose is to separate the two opposing teams and to create a barrier for the ball to cross over after being contacted a maximum of three times by each team. 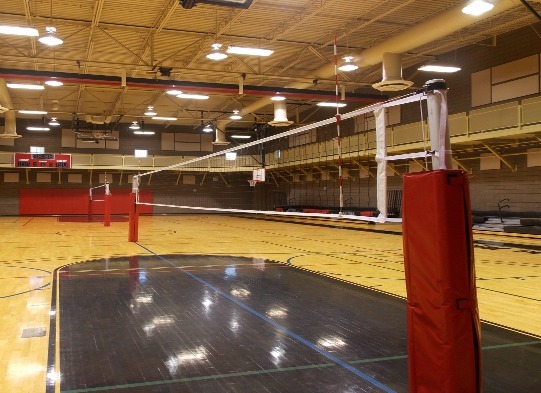 Volleyball Game Rules: The purpose of the volleyball net is to separate the two competing teams and to create a barrier for the ball to pass over during a rally. The official volleyball net height in the women's game is 7 feet 4 1/8 inches. For the men's game the official net height is 7 feet 11 5/8 inches. You cannot touch the net while the ball is in play. You cannot step under the net into the opposing team's court to retrieve a ball as one of your team's three contacts. a) the ball hits the floor - if it hits the floor inside the opposing team's half court then its a Point for your team. Your team gets to serve again. This is called an "ace" serve. a) the ball hits the floor - if it hits the floor outside the opposing team's half court and none of the opposing team's players touched the ball before it hit the floor, Point for the opposing team. Opposing team gets to serve. a) ball is out of bounds. This is called a "sideout." Point goes to the opposing team because you served out of bounds. Opposing team gets to serve. a) ball is out of bounds. This is called a "sideout." Point goes to the opposing team because you served out of bounds. Ball goes to the opposing team to serve. Each team is allowed three contacts of the ball. a) score a point - if it hits the floor inside the opposing team's half court. Point for your team. Your team gets to serve again. c) end the rally - because the ball hit the floor outside of the opposing team's half court. Point for the opposing team. Opposing team gets to serve. that results in the ball hitting the floor on the opposing team's half court before the opposing team can contact it to get it up and back into your team's court. A fault is a playing action that the rules of volleyball do not allow. A rally always begins with a serve by the team on defense to the receiving team who gets three chances to contact the ball with the third contact having to go over the net. Then the opposing team gets three contacts on the ball to get the ball, BACK over the net...this back and forth will continue until the ball hits the floor or goes out on someone's side. This back and forth exchange between the two teams sending the ball back and forth over the net into each other's court is called a rally. When the ball hits the floor, the rally is a completed rally and the team who won the rally is awarded a point. When they (the receiving team) do win the rally, their players will rotate one position, so the last person who served, during the last rally they won, will NOT serve again. For each new rally, the team rotates so they have a new server. Volleyball Game Rules: When the receiving team wins the rally, their players will rotate one position, so the last person who served, during the last rally they won, will NOT serve again. The team of six players who serves the ball is on defense. Volleyball Game Rules: The team of six players who serves the ball is on defense. The opposing team of six the defensive team is serving to...is in serve receive also known as offense, serve reception, or receiving the serve. All these terms mean the same thing. 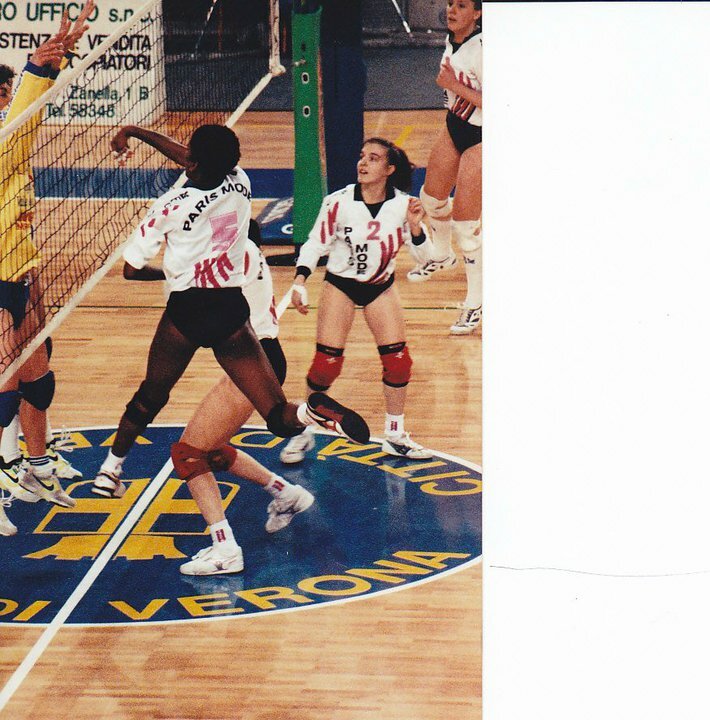 Volleyball Game Rules: Coach April, pro volleyball player in Italy, attacking during a rally. A libero is a specialized role for a player with superior defensive skills. The libero wears contrasting colored jerseys than her teammates so its easy to differentiate her from the rest of the team. This is because a libero can enter in and out of the backrow for a front row player when that front row player has rotated to the backrow to serve. Like a pinch hitter in baseball, the quicker, faster defensively skilled libero will play for that taller player in all three rotations for her in the back row. The player she came in for, will return into the game when its time for the libero to rotate up to the front row. A beginner's explanation of Olympic Volleyball Rules. Watch this short video tutorial guide on how to play Volley ball under Olympic and FIVB rules. jump and attack hit a ball when at contact, the entire ball is completely above the top of the net. This means liberos should generally stand and hit the ball over and not attempt to attack a ball like a tall player would. be inside the ten foot line and set a front row player who then uses their spike approach to hit a ball that's above the level of the net. If a libero sets a ball to a front row hitter and she is inside the ten foot line, the hitter has to hit a down ball . 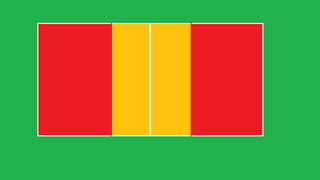 cannot enter the court, at the start of each set, until the second referee gives the go ahead after checking the team's rotation on the score sheet. What Can a Team Do? A team can work together to score 25 points before the opposing team does. The team who is first to score 25 points and has an advantage of two points wins the set. A "match" is a predetermined minimum number of maximum sets that will be played with a pre-declared minimum number of sets that must be won by one team in order to declare a winner. There are the best of five set competitions called "matches". 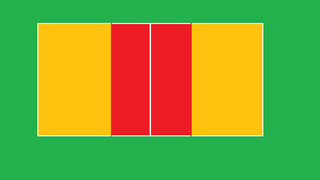 There are the best of three set competitions called "matches". Most collegiate, club and international indoor matches are three out of five sets. The first team to win three sets of 25 points wins the match. Your team can win three in a row. If so your team wins the match. Your team can win two sets, the opposing team wins one, then your team wins the fourth set. If so your team wins the match. If in any order, your team wins two sets and the opposing team wins two sets, then a fifth "tie breaking" set is played. Tie break sets are played to 15 and not 25 points. Rules of Volleyball: Where Do You Go From Here? Learn more about the Court Size.